These pictures sum up Victoria perfectly. This kid loves to read and has an amazing need to soak up all the information she can get her hands on. She’s reviewed this species chart a million times already! She is often distracted from whatever task she’s supposed to be completing by nature and the world around her. She’s a stop and smell the roses (or observe the bug) kind of person. She notices everything. At times it’s a little frustrating but seriously it’s one of the things we love about her. Ashley and the kids picked Dan up from the bus stop in Everett. It makes more sense all around for him to drive in then take the bus there rather than drive home after work or Ashley and the kids pick him up from work. With th.ose two scenarios someone ends up in the car for way longer than is necessary and we don’t save any time at all. It’s the start of Memorial Day weekend so we are expecting it to be busy no matter where we go. Sucia is the our favorite and has the largest anchorage so that’s where we’re headed. The sunset was gorgeous tonight and it was almost 1030 before it was actually “dark”. We had little wind and calm conditions so motored over, dropping the anchor about 1145pm. We were settled and in bed just after midnight and are looking forward to waking up to Sucia. It was great to wake up at achor in Echo Bay. Friday and Saturday there are going minus tides so we’re looking forward to exploring Ewing Cove. We were expecting it to be great. Any low tide at Ewing gives us tons to look at but this was completely unexpected. The only thing we didn’t find on our handy species chart was an octopus. Victoria amazes us EVERY SINGLE time we go exploring with how many species she correctly identifies, how in the world she sees them all and on top of that how she catches some of them! We found orange and purple starfish, Victoria found lots of baby starfish and a blood star. We saw lots of little shrimp and flat fish that were about an inch long and had perfect sandy looking camouflage. We’re guessing they’re baby halibut or sole. Dan and Alexander found a sea cucumber. We also saw the usual crabs and anemones multiplied by 100. We headed back to the marina in the afternoon and got a great view of Mt. Baker on the way back. Before our vacation, we noticed one of our kayaks had a split in the hull from the kids playing on them when they’re on Samadhi’s deck. During the big May trip Dan used a spray on sealant to fix it but it didn’t take. We had promised the kayaks to friends for the weekend so we spent the morning procuring a new kayak. We finally got underway to Cypress Island around 11 and motored over. Cypress Head isn’t the best anchorage so after our first attempt and not liking how the anchor set we motored over to Eagle Harbor. We had lunch then took naps. Apparently, we were all tired as we got up at 5pm! We took off for shore and while there met a couple and their dog that are liveaboards in our marina. We also met a family on a 2 year sailing sabbatical that had a 3 year old son. The kids played together and dogs took turns with Ranger’s ball while the adults talked. Today we took the dinghy over to Pelican Beach with the intention of hiking Eagle Bluff. Once we got to shore, however, it turns out that trail is closed until July 15th and even if it was open dogs (even on leash) aren’t allowed. We ended up doing the Smuggler’s Cove hike which is probably more to Victoria and Alexander’s ability anyway. We had a nice picnic on the rocks there before hiking back. We got some beach time in. In early afternoon we went back to Samadhi, we were contemplating picking up the anchor to go for a sail when a boat with an inexperienced crew came and anchored right on top of us. We figured that was a sign so we started the engine and weighed anchor so they could have the spot we were in. Truth be told we had anchored way too close to one of the DNR buoys anyway. We have a week vacation on Samadhi! Ashley, the kids, the dog and the cat picked Dan up from work and headed to Anacortes. We were getting alerts that a thunder and lightning storm was moving north which we seemed to be about 45 minutes ahead of. We got the truck unloaded, Samadhi loaded and ready to leave the dock just as the storm came over the southern hill in Anacortes. We saw some sheet lightning and it started raining just as we were pulling out of the marina. We decided to go anyway unless it got bad. We had a slip reserved in Victoria BC for the next 2 nights (prepaid of course) and really wanted to get there tonight but knew it might be an uncomfortable trip. Dan found a place on the southern end of Lopez Island that is a hide out in case of storms so knew we could pull in there if needed. Except for some cold rain, we really didn’t encounter bad weather and eventually the rain ceased. We pulled in to Victoria Harbour about 10pm in calm and clear conditions and were tied to the dock by 1030pm. Samadhi is right in front of the Empress Hotel and the Parliament building. Both are beautiful at night. Went out for a lovely and delicious breakfast at a modern diner right in downtown Victoria it was great until a mouse appeared at our table then we were all on edge a bit. From there we visited the Royal BC museum. It is a great museum that we visit whenever in Victoria. We headed back to Samadhi for some lunch and naps then back to the museum to see an IMAX 3d movie. It was about the reefs in the Pacific triangle and the kids seemed to enjoy it. After the movie we walked to the grocery store and stopped at a park for the kids to play a bit. Tomorrow is a big day so we’re headed to bed early. We plan to leave at 4am to head out the Strait of Juan de Fuca and up the western coast of Vancouver Island. The winds are forecasted to be light until the afternoon so we’re expecting a slow sail right into the wind with lots of tacking. The journey is 90 miles which can be accomplished in 18 hours or so. Left Victoria 4am in calm and clear weather to make our way to Barkley Sound. We were expecting wind around 10 kts. We have been working on using weather models as it’s something that we need to master before conquering open ocean. We were seeing 15-20 once we hit the straits. You could literally see a wall of white caps ahead as we found the area where winds and tide and shallow and deep water all converged. The ride got quite rough with Samadhi’s bow lifting as we came off a wave then getting buried in the next one. The kids slept until around 530 when the pounding woke them. We stayed on a SB tack until off the Washington coast then tacked and headed NW on a port tack, we were heeled about 20 degrees with the SB portlights and rail in the water. The kayaks on our deck that are usually strapped on at times were actually floating as the wall of water rushed from the bow of Samadhi back towards the cockpit. Once awake the kids stayed in their bunks watching the water go by their porthole, talking and reading books. Ashley went down to check on them and noticed she immediately felt very seasick forward in the boat. A quick check on them confirmed they both felt the same way and were quite queasy. We got them moved to our bed in the aft of the boat but by then they couldn’t shake the feeling of being queasy. While ferrying them from the forward cabin to the rear we noticed quite a bit of water in the galley, on the countertops and under the oven. Salt water. Ugh, not good. There was no obvious place it was coming in but the galley porthole had quite a bit of water around it’s frame and the 2 in the salon had a bit as well. After getting that cleaned up we got the kids upstairs but it didn’t clear up their feeling sick very much. At 715 we decided that between Ashley and the kids feeling seasick, their fear, higher than forecasted wind, the angles we had to sail at requiring much heeling, and now water intrusion that continuing on for another 13 hours would be uncomfortable and not much of a vacation. Eventually we have to tackle rough sailing but for right now we want the kids to enjoy the boat and sailing. We have a book called “Gentlemen Never Sail to Weather” there’s a reason for this. Sailing towards the wind causes the boat to drop into the troughs between the waves and plow into the next wave thereby making for a very ride. As she slams down into the trough and plows into the next it sends water over the bow and sprays the cockpit. As far as the sails are concerned this is called being close hauled, sails are winched in very tight. It causes quite a bit of pressure on the mast and rigging. Sailing downwind (with the wind behind the boat) the waves gently lift the stern of the boat lifting it and making for a less forceful interaction between the water and the boat. The sails have to be very far out over the sides of the boat but because the angle of the wind can easily cause the sails to go from one side to the other (called jibing) it can create an unsafe situation. A large sail with lots of line (rope) whipping across the boat from one side to the other can cause extreme damage to the rigging (even bringing down the mast) or can injure or knock a person off the boat if they are hit by the boom. So, to keep the sails from coming across unexpectedly we have some tools to prevent this from happening. For the forward sail, we have a pole that connects from the mast to the line that controls how far out the sail can be over the side of the boat. For the mainsail, we have a line that connects to the boom forward on the boat, called a preventer. The preventer give us some peace of mind but we are still very mindful of wind angle because it’s not foolproof, the mainsail is big and the wind powerful so can still cause damage if wind gets on the wrong side of the sail. It was disappointing but felt good to know we would be able to pull into an anchorage in daylight and to rest after a stressful morning. 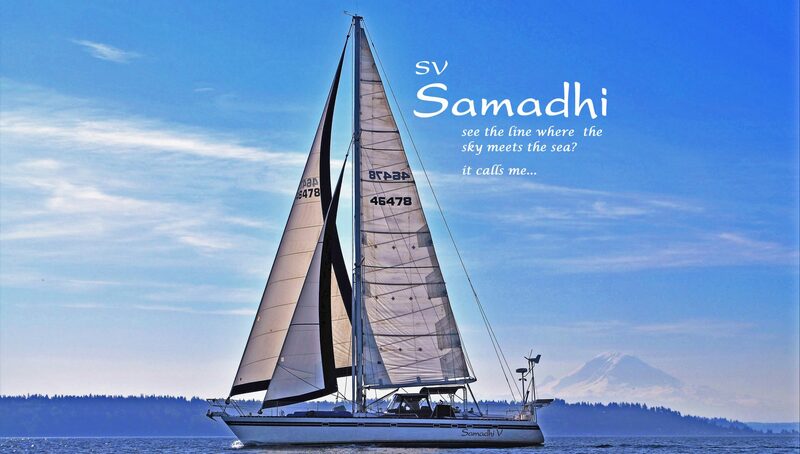 Again Samadhi proved to us she’s a strong and capable boat. We learned that we need to get the kids into the aft cabin before leaving on such an adventure again (even if the wind models say it’ll be light) and that we need to look into resealing or possible replacing some portlights. Yay for another boat project. When we turned back we were headed downwind so set up the main preventer and spinnaker pole and since the seas were now following the ride was much better, we even ate a bit. As we left the straits and headed north up Haro strait the seas got rough again but at least we were on a beam reach and had a much larger margin of error for taking the wind. We tried an anchorage in the gulf islands of BC but it was full so we headed east back into US waters. We ended up at Reid Harbor at Stuart Island. It was wonderful! We found a little island to explore and let the kids get off the boat. Since it was our niece’s birthday (happy 18th Tiffany!) we named the island after her. Stuart Island is a great little island with some hiking, from the anchorages you can get to the north-western corner of the island where a lighthouse and coast guard station are. It’s not a strenuous hike but it is over 3.5 miles each direction. The kids were troopers and made it both ways. There is a 1 room school house along the route that sells shirts, hats and post cards to help fund it. We got the kids shirts on the way back. We couldn’t have been prouder that they hiked 7.3 miles. We saw a swing in a tree, a couple farms, an airstrip with little plane, and old abandoned car (a necessity it seems on these remote islands), and a couple of garter snakes. Dan got up and ran over 3 miles with Ranger this morning. Ashley and the kids just had a lazy morning. We left Stuart around noon and headed over to Jones Island. We didn’t see any deer but did take the obligatory Murphy picture in the Murphy tree (we forgot the tripod and no one was around to take a picture for us so Ashley is missing in the picture). After a quick trip to shore we got back underway and headed to today’s destination… Patos Island. Patos is the most northern San Juan Island, the anchorage is tiny and shallow though we got Samadhi in fine. Thankfully just 1 other boat was here and they were on a buoy so didn’t need much swinging room (Samadhi swings a lot and she needs lots of room). Dan and the kids went to shore while Ashley stayed behind to take a nap in the cockpit and have some quiet time. It mostly was quiet except Ranger kept whining because he wasn’t onshore with the family. The kids found tide pools, little crabs, hermit crabs and all were impressed by the beach on this little island. It’s the first time any of us have ever been here and Dan says it’s his new favorite island. This morning we went to the beach and gathered drift wood, shells, lichon & moss, and sand. Dan remembered a fun craft from his childhood where they created a little beach scene on little pieces of driftwood. We recreated them and they are adorable! They made them for their grandparents and couldn’t be prouder! After the beach craft we hiked the short walk to the light house. Upon returning to Samadhi we pulled up anchor and sailed to Sucia. We attempted a few different techniques with the spinnaker pole and the genoa. We still fumble like idiots with it and are out of ideas. We anchored in Echo Bay, took naps then headed over to Ewing Cove. We packed up the kids’ school work and hiked over (hike is probably a stretch, it’s less than a mile) over to Shallow Bay. We sat at a picnic table for their lessons and then played on the beach. Tomorrow is forecasted to rain. We’ve had great weather this trip, other than a bit of rain Friday when we were in Victoria, so have decided to head back to the marina tonight. After nap we went for one last trip to Echo Bay. We pulled in to the marina about 8pm and had lots of cleaning up to do. One week with 2 adults, 2 kids, 1 dog and 1 cat and poor Samadhi is dirty! We left for home after 10 so didn’t get there until almost 1am. We woke up to pouring rain, which Ashley was thankful for. She didn’t want to come home so early in Dan’s week off but was happy to be home during the rain. Headed to Cypress Island this morning, no wind is forecasted for the day. We decided to anchor at Cypress head vs. Eagle Harbor this time. It’s a small anchorage with mooring buoys, the depth is either really deep or really shallow and there is LOTS of eel grass which makes anchoring difficult. The buoys are only rated for boats up to 45’ so we have to anchor, when we back down on the anchor you can literally feel it bouncing until it catches which is a strange feeling because our monster anchor usually catches immediately. Anyway, we attempted the Cypress Head hike up to the airfield. We only made it 2 miles before the kids were starving and had to be fed immediately. With no lunch packed we headed back to the boat to make lunch. After lunch the winds picked up and the anchorage got uncomfortable so we weighed anchor for home. Our wind gauge hasn’t been registering speed so Ashley went up to the top of the mast to take a look. We figured the marina’s resident bald eagle had damaged the wind transducer. Nope, there was sewing thread stuck in it which was keeping the paddles from turning. How or why will remain a mystery. After getting the thread pulled out we motored to Spencer Spit arriving 830pm. We spent Saturday playing on the beach. We weighed anchor 530pm to motor back to the dock. We saw an otter eating his dinner on the dock, which never gets old. Spent Thursday night at the boat, Friday morning got up and headed to Cap Sante to fuel up. The furnace has run quite a bit this winter and pulls from our SB side (the side we like to keep as heavy as possible, as good ol’ Samadhi lists to her port side). Yup, the furnace used 42 gallons since we fueled up on 1/28/17. We motored to Cyprus Island and hiked to Reid Lake. After the hike we played on the beach. The kids got wet enough that they might have been swimming. It’s March. And Cold. We got the dinghy stuck on the mud flat and when we finally got it off we headed back to Samadhi for lunch and to watch Moana (our current family favorite movie). Weighed anchor at 1730 and headed back to Anacortes Marina.